Exceptional quality throughout this Premier Valley custom home! Located in the serene and exclusive Sky Ranch Gated Airstrip Community. Sitting right on the airstrip w/ own custom hanger, makes this any pilots dream! Stunning grand entrance staircase, soaring 2-story ceiling w/ dramatic wall of windows in open concept great room. This home is an entertainers delight! Master Suite you must see! With 4 large bedrooms, a private office, theater room, and a bonus room....there's a room for everything you would need! Circular driveway with nice size 3 car garage. Large lush green yard with lots of room to play! Neighborhood hosts a private lake with neighborhood access, private trails that lead to the river where you can find excellent fishing holes and trails to ride 4 wheelers and side by sides. The hanger is HUGE and ready to not only host your airplane, but enough room for toys and a full workshop! There is a full bathroom with a shower in the hanger to clean up after a long day of working in the "shop"! Direct access to runway, which is maintained by the HOA. Beautiful view of the historical colonial barn that sits near the runway and is maintained by the HOA. History right out your doorsteps! Sky Ranch was designed with pilots in mind and is known to have less wind than other typical Palmer areas. Views are stunning and your neighbors and the neighborhood parties make living here warm and welcoming! So much to offer with this home for the price! You will NOT find this price point ANYWHERE else in the Valley!! 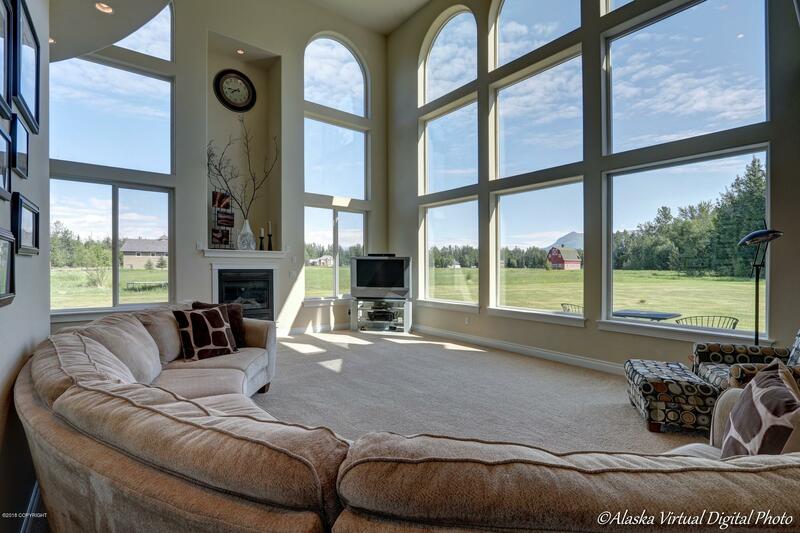 Great Room: Gorgeous Floor-Ceiling Windows/Views!! Kitchen: Open Concept W/High-End Finishings!